Hello, and thank you for checking out my project~! I'll try to make this quick. This is a Love Live English Cover Group Project. 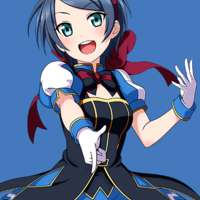 However, unlike many groups that aim to mimic the sound of u's or Aqours, we will be creating our own unique sound... And using the N Girls from Touu Academy for inspiration! Because we are singing with the goal of sounding different from u's and Aqours, but are covering their songs, many of our covers will deviate from the originals. For example, Strawberry Trapper could be a 9 girl song and Aishiteru Banzai could be a subunit song. These decisions will be made as a group. When you are cast, I will send you two translyrics and the singing guides. Basically, you will always have the next song we are singing so that you can record early and not stress later. As soon as you turn in your vocals for one song, you will get the next one in return. Additionally, all of our covers will be short versions. This will give us time to really dial in and produce our best result. I may ask you to re-sing your part up to two times or send you a harmony part to sing. This is not because I dislike your singing, but because enough on small fumble-- so small you can't hear it in a solo-- can make the lyrics jumbled for the group version. 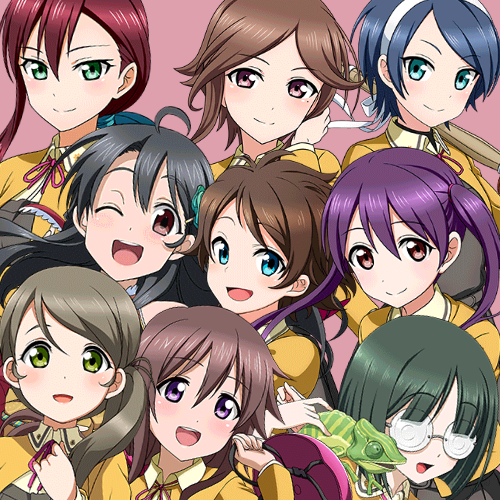 Lastly, we will hopefully record readings for all of the girls' side stories as time goes on. This part is mostly for fun, but because of it, please be prepared to speak and sing in the same character voice! Our group is aiming to create a unique sound. Our group does not have a name yet. When we are all cast, we will take name suggestions and work something out for the Touou girls together. Similarly, we won't know the subunits right away. We will decide on them after we finish two group covers and have had a chance to hear ourselves singing together. After subunits are been decided, we will select names and subunit songs. I am most likely to replace you during the first two songs if you miss deadlines. After that, we will hopefully have created a "pillow" of backlog that will let you miss a few deadlines without holding us back. This is for fun. It isn't a job. I want you to prioritize your school, job, and friends. [x] Please record your audition in a single take~! And do not add instrumental tracks-- But time it to an instrumental! I will download auditions I really like and create a sample. This is so I can hear your voice (and mic,) solo, then hear how well you time & tune with the instrumental. [x] Please do not use noise removal. Leave me 2 to 3 seconds of silence at the end of your audition. I will do all of the sound removal myself. This is make sure we all sound like we're in the same space together. [x] Hint: Takaramonozu will be one of the first songs that we sing. Singing that will give me a hint that you read my long as heckies details. It isn't required!!!!! [x] For each round of auditions, please only audition for 3 girls maximum. Indicate with a comment which girl you click with the most, and I will prioritize your favorites when casting. [x] If you are willing to help with mixing, lyrics, or videos, please indicate such with a comment to your audition. Right now, I am doing all of the mixing, lyrics, and videos. If we have more help, then we can produce more songs and probably increase the quality as well as quanitity. THANK YOU SO MUCH for staring at this long thing. LET'S HAVE FUN! Character: Ryou is strongly devoted to performing for the sake of entertaining others. She gives her all to her performances and seems to be almost maniacally dedicated. Ryou practices theatre and decided to be a school idol to further the art. She likely adopts a stage persona, which may be where her whimsical speaking pattern in earlier sidestories came from (it disappears as the stories become more personal.) Ryou is also comfortable assuming any gender for her performances. Her Japanese dialogue is gender neutral and rarely uses pronouns. Her personality also seems to be nurturing and parental, as she helps with a children’s performance and offers to help the player a lot.
" Oh, excuse me... Did I surprise you? I'm Ryo Aikawa, a third-year student. I put on gorgeous clothes and climb onto the stage to become anyone--male or female, young or old." Voice Preference: An energetic but controlled voice; she looks very young compared to the other girls. NOTE: The current costume set seems to be implying Shun may be the leader, or at least center for a few songs.
" Hello! I'm Shun Kurosaki. Hobbies? ...Probably horseback riding. I've loved riding horses since I was little. I probably would've ridden a horse to school if they'd let me! " Character: She has a very long and traditional name and seems to be close to Tsurugi, so it’s likely she comes from a traditional family with some ties to the shrine. Himeno says some very poetic things from time to time, but is also very silly (HIP HIP HORRAY, and making “hop hop” bunny sounds.) 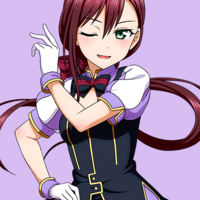 Himeno has a delicate image, but she’s very energetic and impulsive with her energy (she punches you if you touch her, then apologizes for the reflex.) Though Himeno loves photography and admiring others, she mentions that she gets freaked out and self conscious when she’s on the receiving end. She seems to be especially close to Tsurugi and keeps Tsurugi in line. She probably dragged her into the club.
" Nice to meet you. 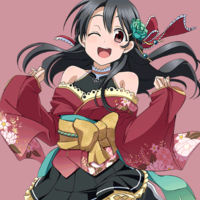 I'm Himeno Ayanokoji. I'm in the flower arranging club, and I'm also a school idol. Isn't it hard to be in two clubs at the same time, you ask? Not really. I'm really happy when I can do what I enjoy. " Character: Koyuki is soft-spoken and well mannered. She is likely in charge of choreography for the group, since she practices ballet. 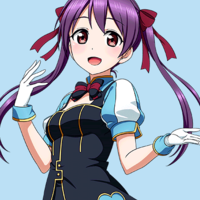 Koyuki likes to perform for people and make them happy, as evidenced by all of her performing (singing, dancing, acting,) but is particularly interested in the people she’s with. Namely Ryou: Koyuki talks about Ryou constantly. Despite her soft and shy look, Koyuki’s dialogue is a bit punchy at times. For example, she says she’ll read the sidestories without you and is very stern about how much you can touch her. Similarly, she herself asked to join a school play because she wanted to be with Ryou. She doesn’t back down from things she wants. ** Line Note: When Koyuki says she is not that cold of a person, she's referring to how her nicknames mean "snow." " I'm Shirase Koyuki. People usually call me Yuki or Shirayuki, but I'm not that cold of a person. As a school idol, there are always so many people cheering me on. It makes me feel nervous and excited." Voice Preference: Playful, Flirty? Mysterious. She’s one of the mature girls, but her attitude is very young. 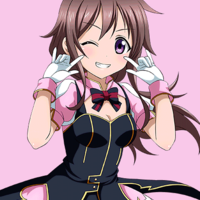 Character: Misaki is self confident: In her skills and body. She says that she is often very busy, and half of her sidestories are of her working part-time jobs. It’s even implied that Misaki cuts school to go work, as she is called an “outlaw” that doesn’t get seen much. She will often flirt and tease with the player, and turns everything into a game or competition. 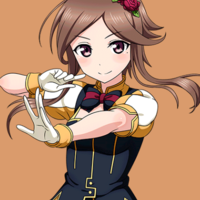 We know Misaki practices stage magic and mystifies her classmates.
" Hmm... I'm Shidou Misaki. Would you like to give billiards a try? I'll teach you. Oh, you're confident, aren't you? Want to play a game then? I'll let you break. " Voice Preference: A “disciplined” voice. Character: Likewise, Tsurugi has had some character development. She started out being very vocal about not wanting to participate in idol activities, but has since started to enjoy them wholeheartedly. Tsurugi is definitely a tsundere. She is a strong girl who puts all of her effort into what she does. She practices kendo (always carrying her bamboo sword,) and her family lives at a shrine, so she is likely very well disciplined. Tsurugi is also the seamstress for the group. "I'm Kadota Tsurugi. Hmm, this bamboo sword? It's because the sword is the heart of the samurai. Put it away when I'm onstage...? Wait, "onstage"? Th-This is news to me! W-Wait! Don't just take me by force!!" Comparison: Hanayo / Ruby | Nico for Gyoro? Character: Fumi’s character has developed over the course of the side stories. She is always very shy and uses Gyoro to express a more forward side of her personality. Fumi is very modest and seems more comfortable having other people make choices for her, so will have Gyoro make her bold choices (ex. : What direction they walk in, how much food they eat, etc. ) This tactic also gives Fumi courage, as she seems to more confident in other people than herself and needs outside permission to be brave. As the stories have gone on, Fumi is getting more confident in herself and seems to be recognizing it.
" Umm, I'm Shitara Fumi. U-Umm! This is Gyoro-chan! " 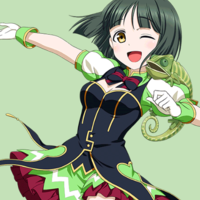 (Gyoro Voice:) "I'm Gyoro-chan, gyoro!" (back to Fumi: ) " ...Please say something. This is embarrassing. " Voice Preference: Bright & Energetic, perhaps with a nasally/tomboyish note. Character: She is on the track team, and mentions that she has a lot of body confidence (and then wears a lot of skintight outfits, so it must be true.) Fuu worries slightly about being a cute idol, but is aware it’s not good to go overboard. Though she is a high energy girl who joined the club for the activity, Fuu gets worn down by mental exercise and by staying still. Her sidescreen comments imply that she takes interest in the other girls’ physical activities, like horseback riding and kendo.
" Saiki Fuu here! ♪ I'm an energetic girl who loves running! Thanks for cheering me on, everyone! ♪ ...Huh? Did I say something wrong? " Voice Preference: Confident but gentle: She’s used to using her voice on the radio broadcasts. 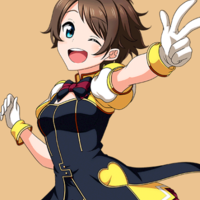 Character: She works in the broadcasting club and hosts a radio program, so she has voice confidence. She likely works on mixing their songs and dealing with the recording equipment. Yuuka mentions that her reason for becoming an idol is that she wants to meet more people. 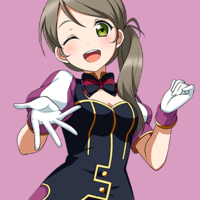 Her side stories imply her to be a friendly girl who listens to her friends and tries to stay neutral.
" I'm Kirihara Yuuka, a second year! I'm a member of the broadcasting club and responsible for the daily announcements during lunch. "